JustforJeeps.com has everything you need to keep your Jeep running right and looking good, from replacement parts to dress-up accessories. The chrome exhaust tip (Mopar part number 82208439AD) is a simple touch that adds a little extra style to the rear of your Jeep Wrangler. 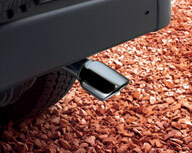 The chrome tip slips over your existing exhaust pipe for easy and fast installation. It is made of chrome-plated stainless steel to meet Chrysler standards for resistance to corrosion. With a 3-inch outer diameter and 2.5-inch inner diameter, it fits Jeep Wranglers with V6. Easy to install, adds a nice touch to rear of jeep, LOOKS GREAT. Easy to install and looks good. Already got a compliment on how good it looks. Installation time took around 5 minutes and the chrome exhaust tip looks awesome on my Wrangler. Even someone completely un mechanically minded like myself can install this item. Nice touch for my dress up jeep.